Many patients over the age of 40 will experience presbyopia, or age-related farsightedness. The condition, which causes up-close items to appear blurry, makes it difficult to read books, cell phones, and menus when held directly in front of their eyes. As a result, patients may have to hold items farther away, causing the development of headaches and increased fatigue. If you think you may be suffering from presbyopia, Dr. Sonny Goel in Baltimore, MD, can provide you with a variety of treatments to help correct and improve your vision. 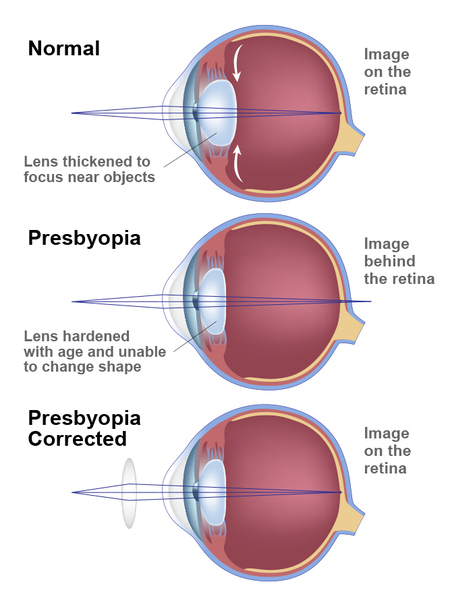 Presbyopia is a result of the natural aging process that occurs when the crystalline lens of the eye, which lays directly behind the iris, loses flexibility. As a result, the lens is unable to change shape, making it difficult to focus on close images. Over time, presbyopic patients strain to see small, up-close print. Many patients suffering with presbyopia commonly hold books and magazines at an arm’s length to properly focus on the material. Presbyopia is a common part of aging, but thanks to a series of advanced medical procedures, you can regain close focus. LASIK Monovision: Through one of our various types of LASIK treatments, we are able to treat presbyopia by creating monovision. Using state-of-the-art procedures, we correct the near vision in one eye, and correct the other eye for distance. Monovision, or monocular vision, will allow you to see closer items with the non-dominant eye, and items that are farther away with the dominant eye. We can arrange for you to wear special lenses to simulate the effect, helping you determine if you would like to pursue monovision. Conductive Keratoplasty: The cornea, or dome-shaped front surface of the eye, contains a meshwork of collagen fibers. Conductive keratoplasty is a minimally invasive procedure that uses a series of controlled radio waves to deliver heat energy that constricts the collagen fibers, resulting in a reshaping of the cornea. This refinement can complement changes in the lens, helping you to regain up-close focus. Refractive Lens Exchange: RLE involves the replacement of the natural lens with a synthetic monofocal or multifocal lens called an intraocular lens (IOL). The treatment is also used to to correct vision in patients with cataracts. Prescription lenses are also an option for patients who would prefer not to undergo a surgical procedure. During your consultation, we can discuss the various types of lenses available, including bifocals, progressive lenses, trifocals, and more. If you have noticed that you have begun to hold items at a distance to see them clearly, or have begun to experience headaches and fatigue while reading, you may be suffering from presbyopia. Presbyopia is a common part of aging, but thanks to a series of advanced medical procedures, you can regain close focus. To learn more, please schedule a consultation today.